killed this afternoon by falling from the wind mill. Thursday October 17th 1901 We worked in the forenoon at scraping paper from the wall. In the afternoon Ida and I went over in the Sangster pasture for crab-apples. 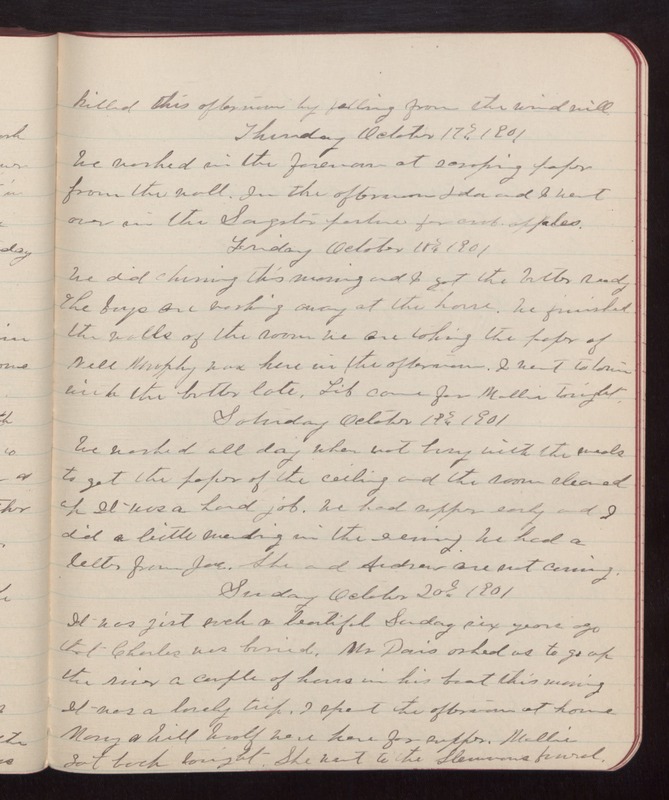 Friday October 18th 1901 We did churning this morning and I got the butter ready The boys are working away at the house. We finished the walls of the room we are taking the paper of Nell Murphy was here in the afternoon. I went to town with the butter late. Lib came for Mollie tonight. Saturday October 19th 1901 We worked all day when not busy with the meals to get the paper of the ceiling and the room cleaned up It was a hard job. We had supper early and I did a little mending in the evening. We had a letter from Joe. She and Andrew are not coming. Sunday October 20th 1901 It was just such a beautiful Sunday six years ago that Charles was buried. Mr Davis asked us to go up the river a couple of hours in his boat this morning It was a lovely trip. I spent the afternoon at home Mary & Will Woolf were here for supper. Mollie got back tonight. She went to the Stevensons funeral.